This was finished AGES ago but I’ve been super busy and not had much time for the blog. I’ve also bought Andy’s red A4 and the 1.8T is currently SORN but as these were a series I thought I’d better finish it off. The airbag cage in all these photos is the one I bent to hell separating it from the dash which I later found was completely unnecessary. With the unbent cage the airbag cover now sits completely flush. The shadows shown here highlight the gap towards the front created by the bent cage lifting the cover proud of the dash. I’m now thinking about removing all the alcantara and replacing with stock parts in order to sell the car on. Sad, but I don’t have the space to keep two cars. I don’t think I’ll be doing a retrim in the red V6 as I don’t see that being a project like this car was, so the dash and console will probably end up on ebay. The airbag logo embroidery came out really good, although I’d have prefered it slightly smaller Luke at Plush said it wasn’t possible. He knows what he’s on about and I can understand how embroidery is going to have limitations when trying to produce small text. Maybe debossing would have been an option to get a smaller logo with a OEM look. And that’s about it. Wasn’t that difficult of a project overall and the extra effort to ensure airbag functionality wasn’t impaired was definitely worth it. Wow! I’m loving the way this looks! I have a 2003 Audi A4 Avant. I was considering getting something new, but i decided to drive it until the wheels fall off. 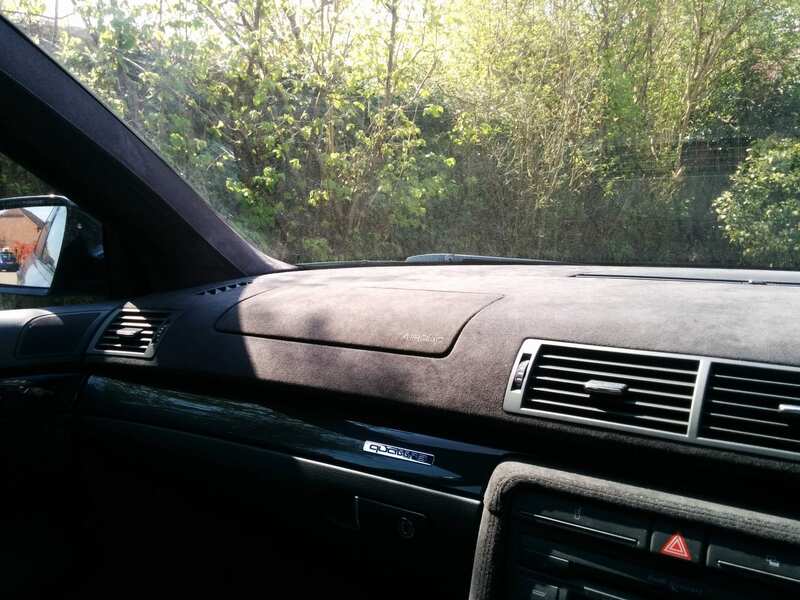 I do want to spruce it up a little – alcantara upgrades to the interior – new radio and speakers, suspension, clean up the bumpers, door flares and so forth. My car is the same color as yours and i’m getting inspired by your set up. 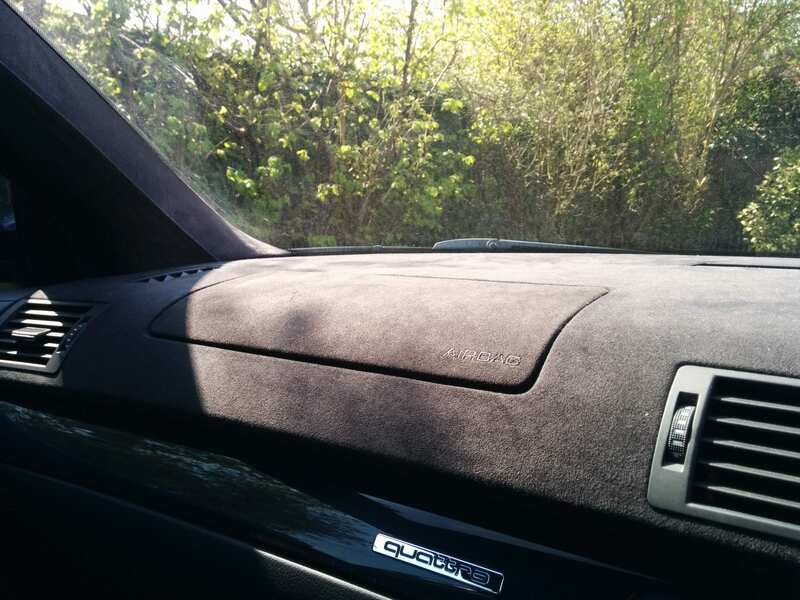 I do have some questions – what does it cost to get the alcantara dash and center console done like you have done? Hi Maron, pleased you like it! I’m so happy with how it’s turned out but it wasn’t cheap. The center console was about £500 and the dash £350. I can’t remember the exact figures, it was a while ago now. Plus I did all the custom work making the airbag cover myself. Most retrim places just cover straight over the airbag or at the most stitch around the line where the dash is designed to break open. I didn’t like the idea of that and am very happy my version won’t affect the airbag at all. Thanks for the info – what new car did you go with? I didn’t understand part of your message (P/x original dash and console + reasonable cash.) Does that mean you want my dash plus cash? Do you have link in your site that shows parts for sale? Yea, you got it, I meant part exchange an original centre console and dash. There’s no ‘for sale’ section on the site (maybe I should add one? ), the dash is still in the car. I’m thinking about returning it to pretty much standard and selling all the nice mods separately. The new car is another B6 A4, 3.0 V6 this time. But pretty low milage so interior is damn near perfect anyway, it really doesn’t need anything retrimmed so happy to see my dash and console go. I didn’t do the dash myself but I’m fairly sure Plush used a brush on high temp fabric adhesive, the same as I used for my headliner. Did you ever sell the alacantrs interior & dash in the end? Hi Derren, I still have the dash and centre console, they’ve remained in the sliver A4 which is SORN as I’ve been driving the red 3.0 V6 instead. The rest of the interior that I trimmed myself hasn’t stood up to the years of sunlight exposure as well as the genuine Alcantara. 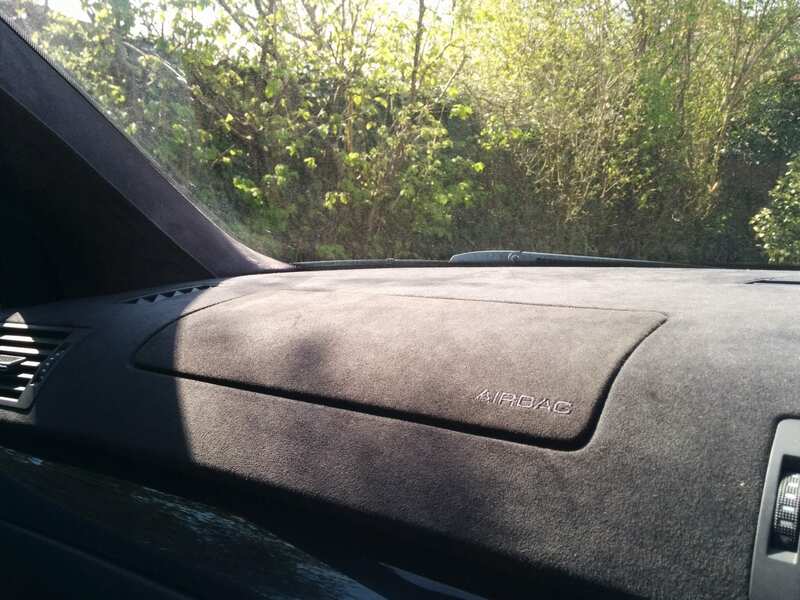 The faux stuff has definitely faded while the Alcantara still looks brand new. If you’re interested in them, let me know. I don’t need two cars and I certainly don’t need a nice interior in a car I no longer drive.